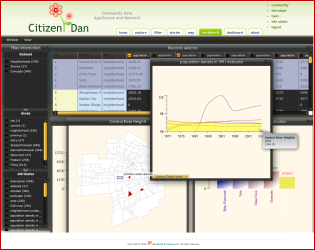 Today, Structured Dynamics is pleased to make its Citizen Dan application available for public viewing, play and downloading for the first time. 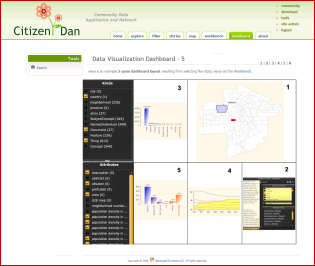 Citizen Dan is a free, open source system available to any community and its citizens to measure and track indicators of local well being. It can be branded and themed for local needs. It is under active development by Structured Dynamics with support from a number of innovative cities. 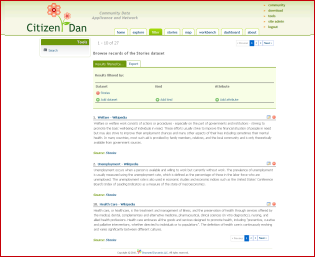 Citizen Dan is an exemplar instance of Structured Dynamics’ open semantic framework (OSF), a generalized framework for deploying semantic platforms for any domain. By changing its guiding ontologies and source content and data, what appears for Citizen Dan can be adopted for virtually any subject area. Potential node in a global network of communities across which to compare indicators of community well-being. 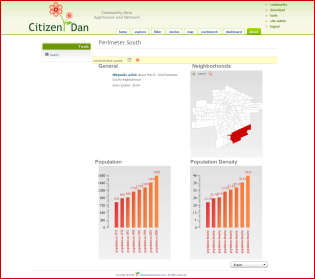 Citizen Dan’s information sources may include Census data, the Web, real-time feeds, government datasets, municipal government information systems, or crowdsourced data. Information can range from standard structured data to local narratives, including from minutes and reports, contributed stories, blogs or news outlets. The ‘raw’ input data can come in essentially any format, which is then converted to a standard form with consistent semantics. Text and narratives and the concepts and entities they describe are integrally linked into the system via information extraction and tagging. All ingested information, whether structured or text sources, with their semantics, can be exported in multiple formats. 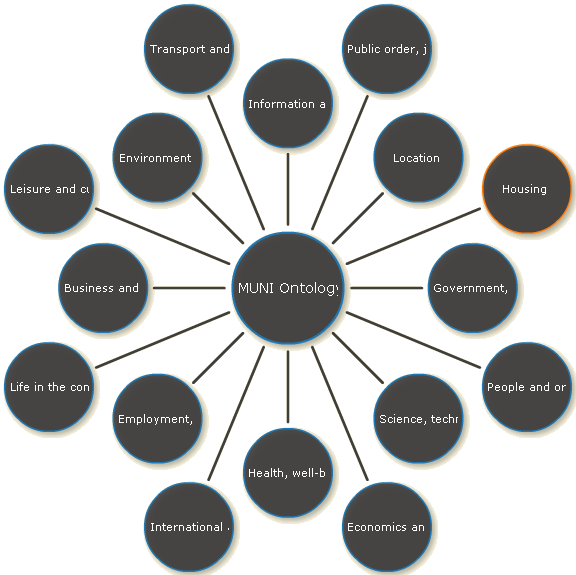 A standard organizing schema, also open source and extensible or modifiable by all users, is provided via the optional MUNI ontology (with vocabulary details in development here), being developed expressly for Citizen Dan and its community indicator system purposes. 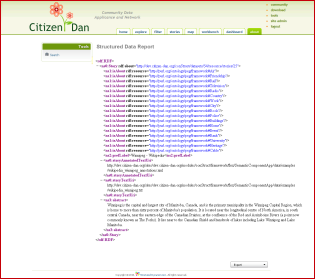 All of the community information contained within a Citizen Dan instance is available as linked data. Records Manager — every dataset can have its records managed via so-called CRUD rights. Depending on the dataset permissions, a given user may or may not see these tools. See further the technical documentation for each of these create – read – update – delete tools. In addition, it is not possible in the demo to save persistent dashboard views or submit stories or documents for tagging, nor to register as a user or view the admin portions of the Drupal instance. The sample data and content in the demo is for the Iowa City (IA) metropolitan statistical area. This area embraces two counties (Johnson and Washington) and the census tracts and townships that comprise them, and about two dozen cities. Two of the notable cities are Iowa City itself, home of the University of Iowa, and Coralville, where Structured Dynamics, the developer of Citizen Dan and the open semantic framework (OSF), is headquartered. The text content on this site is drawn from Wikipedia articles dealing with this area. About 30 stories are included. The data content on the site is drawn from US Census Bureau data. Shape files for the various geographic areas were obtained from here, and the actual datasets by geographic area can be obtained from here. 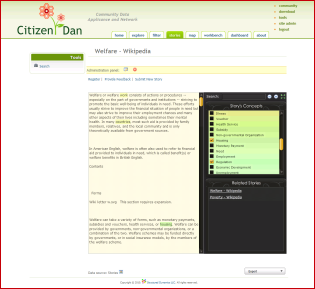 Citizen Dan is an exemplar instance of Structured Dynamics’ open semantic framework (OSF), a generalized framework for deploying semantic platforms for specific domains. irON (instance record object notation) for dataset ingest and exchange. 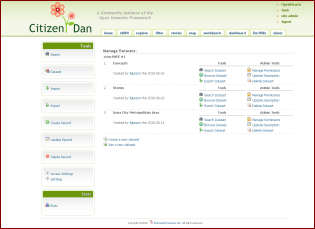 The software that makes up the Citizen Dan appliance is one of the four legs that provide a stable, open source solution. These four legs are software, structure, methods and documentation. When all four are provided, we can term this a total open solution. 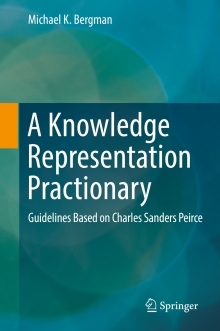 DocWiki (with its TechWiki subset of technical documentation) that provides the accompanying knowledge base of methods, best practices and other guidance. In its entirety, the total open solution amounts to a form of capacity building for the enterprise. Inherent in the design and architecture of Citizen Dan is the potential for each instance (single installation) to act as a node in a distributed network of nodes across the Web. Via the structWSF Web service endpoints and appropriate dataset permissions, it is possible for any city in the Citizen Dan network to share (or not) any or all of its data with other cities. This collaboration aspect has been “baked into the cake” from Day One. The system also supports differential access, rights and roles by dataset and Web service. Thus, city staffs across multiple communities could share data differently than what is provided to the general public. 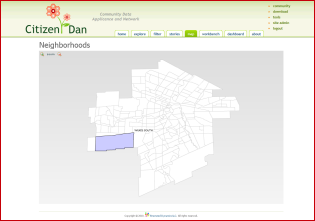 Since all data management aspects of each Citizen Dan instance is also oriented around datasets, expansion to a network mode is quite straightforward. 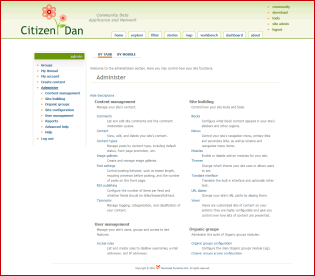 The Citizen Dan appliance is based on the Drupal content management system, which means any community can easily theme or add to the functionality of the system with any of the available 6500 open source modules that extend the basic Drupal functionality. All other components, including the multiple third-party ones, are also open source. Install your own datasets. You may want to inspect the sample Citizen Dan datasets and learn more about the irON notation, especially its commON (spreadsheet) use case. For questions and additional info, please consult the TechWiki or the OpenStructs community site. Finally, please contact us if you’d like to learn more about the project, investigate funding or sponsorship opportunities, or contribute to development. We’d welcome your involvement!